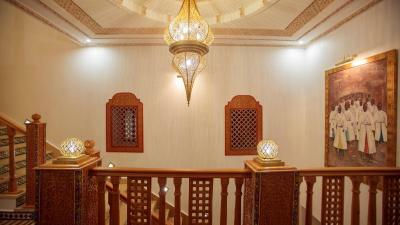 Lock in a great price for Palais Zahia - rated 9.3 by recent guests. 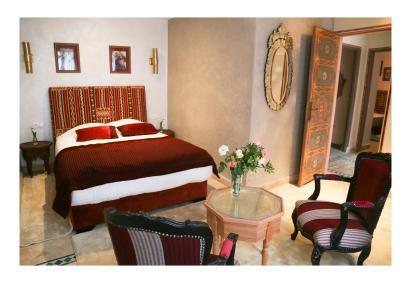 Very nice and clean rooms, with authentic looking decoration. 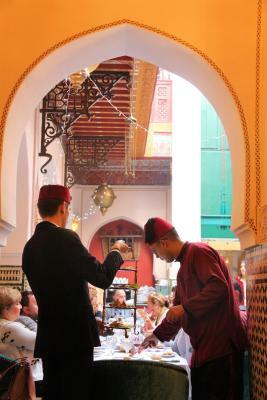 The staff was very friendly and helpful and the breakfasts were nice, with a lot of choice. Great staff, clean and well kept place, good breakfast. We were travelling with our infant daughter and they were kind enough to give us a cot for her. Would definitely stay here again! 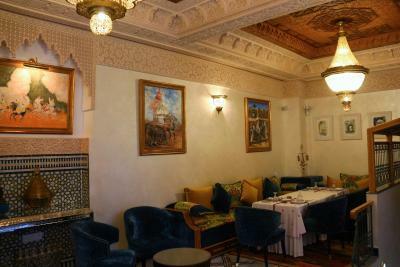 Beautiful hotel in an excellent location in the Medina (the historical town). The staff is extremely helpful and smiling. 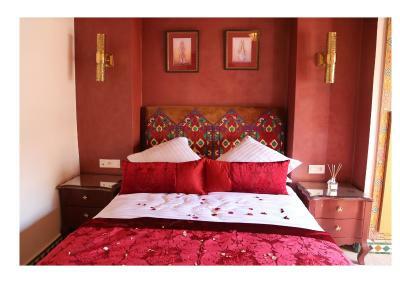 The rooms are lovely decorated and very comfortable. The hotel has a restaurant that is also very nice, although a bit expensive. Views from the roof terrace are amazing! My wife tried the spa (hammam) and was very pleased. Very attentive and charming staff. Everyone was extremely helpful and went out of their way to make our stay enjoyable. They gave us a choice of rooms when we arrived. 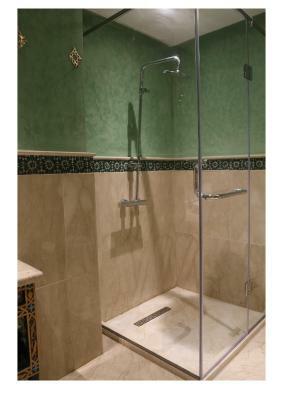 We chose one with a bathtub which was absolutely divine. 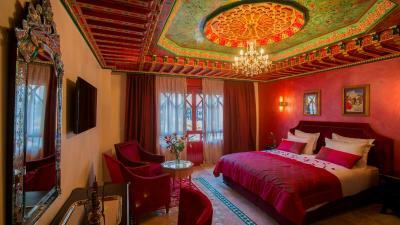 I would recommend this hotel to anyone visiting Tangier. 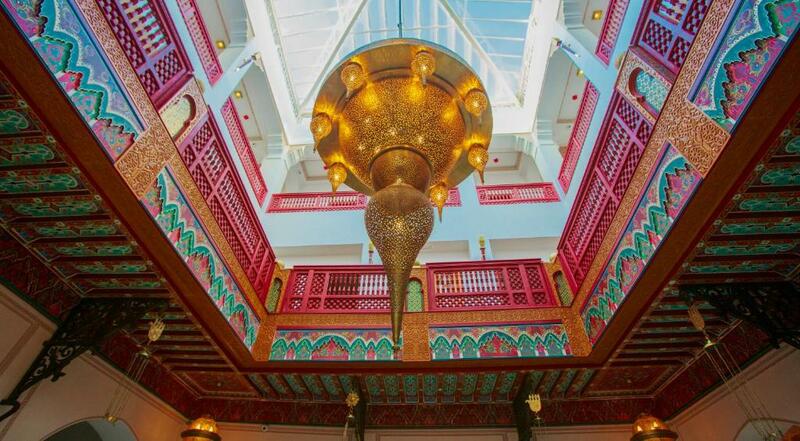 The Palais Zahia is a truly magical place to stay. 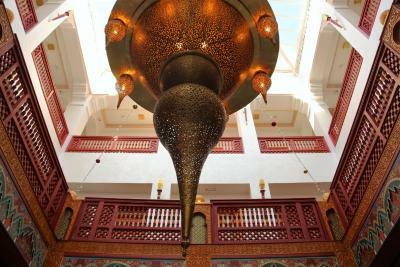 We stayed in The Sultan Suite and it is wonderful, full of exquisite workmanship, the ceiling is spectacular. The staff are so friendly and extremely helpful, Amina at reception was amazing. 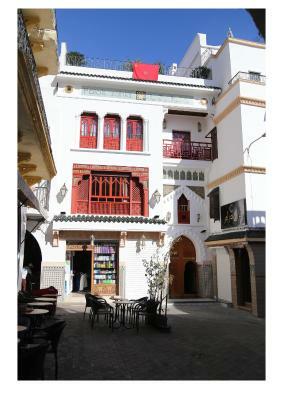 The hotel is a true oasis and right at the entrance of the old town, so easy access to everywhere. Food is fantastic too. The hotel arranged a guide for us, Majid who was extremely knowledgeable and enthusiastic. He went out of his way to ensure we saw all the sights. 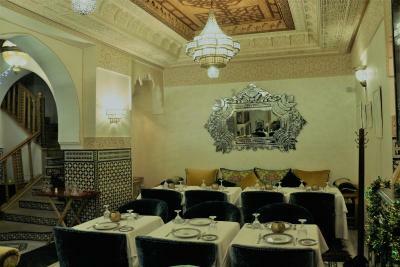 This is a must stay place when in Tangier’s. Great old town location-if difficult to find initially. Staff superb! The family room was absolutely perfect, the best family room I've ever booked, with nice separation between adults and children but very safe at the same time. A lovely restaurant serving local cuisine. The staff were brilliant and really friendly. Rooms were nicely done up and quite pretty. 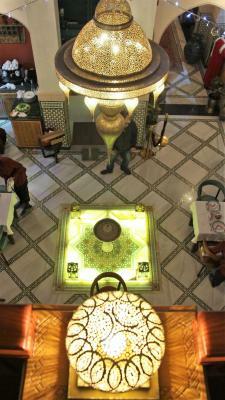 The hotel was reflective of Moroccon decorations. The atmosphere of the hotel is fantastic. The decor is beautiful. The staff was very friendly. 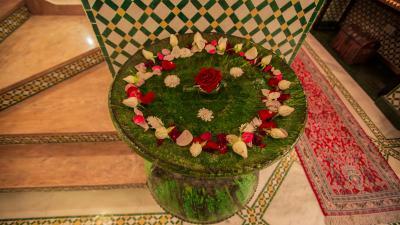 Decor of the palace, and the service provided by the excellent staff. 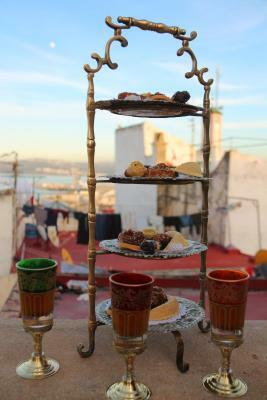 Location convenient for exploring Tangiers. Car service to and from Rail station excellent. 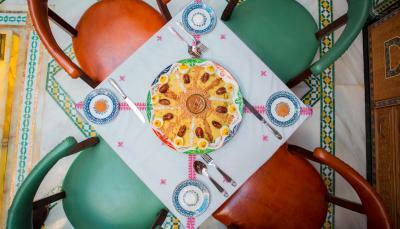 One of our top picks in Tangier – and a guest favourite. 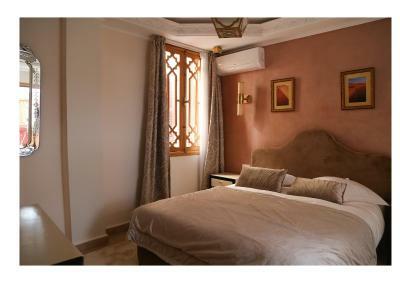 Situated in Tangier, Palais Zahia offers rooms with air conditioning. 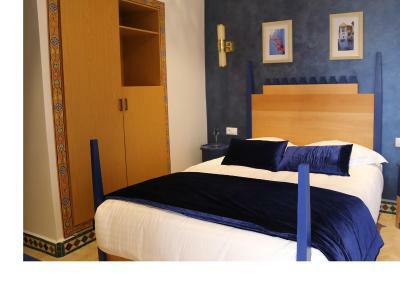 Located around 4.3 miles from Cap Malabata, the hotel with free WiFi. At the hotel, all rooms are fitted with a desk. 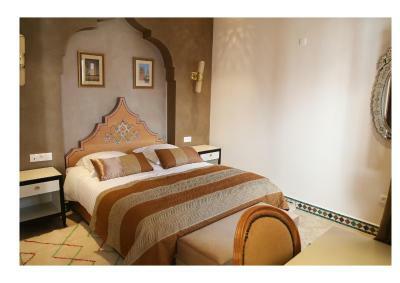 The rooms are fitted with a flat-screen TV, and certain units at Palais Zahia have a terrace. At the accommodation, all rooms come with a seating area. 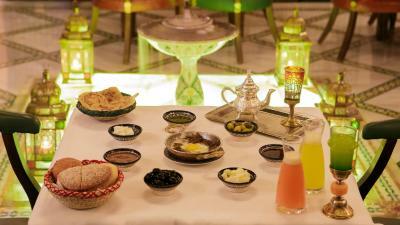 A halal breakfast is available daily at the property. 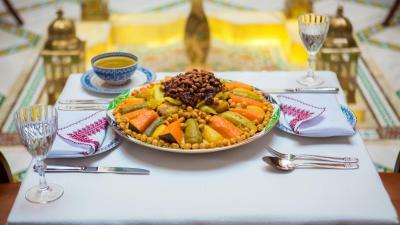 At Palais Zahia you will find a restaurant serving Moroccan cuisine. 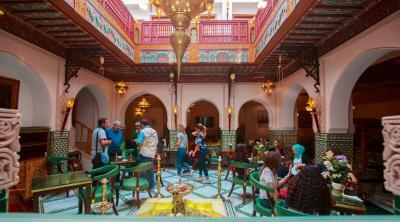 Palais Zahia also provides a business centre and guests can check the newspapers at the accommodation. 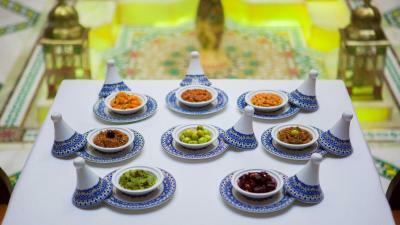 The reception at Palais Zahia can provide tips on the area. 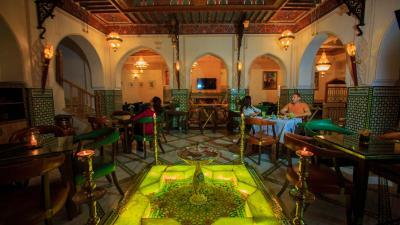 American Legation Museum is 200 yards from the hotel, while Kasbah Museum is a 4-minute walk away. 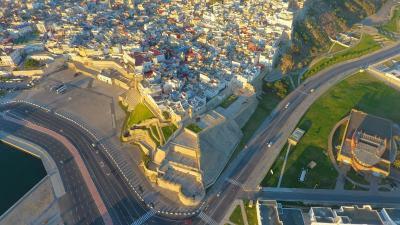 Tangier Ibn Battouta Airport is 7.5 miles from the property. Transfer from Tarifa Port is offered. 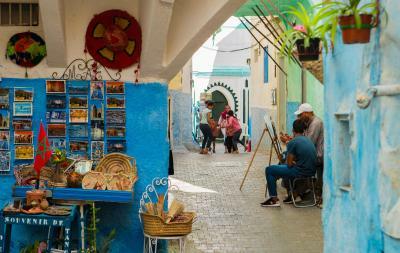 Old Medina is a great choice for travellers interested in markets, Old Town exploring and culture. Palais Zahia has been welcoming Booking.com guests since 11 Nov 2017. 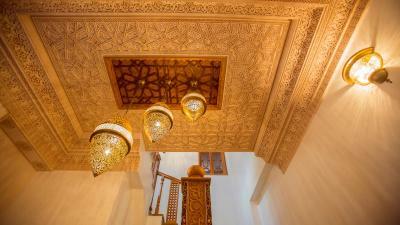 When would you like to stay at Palais Zahia? 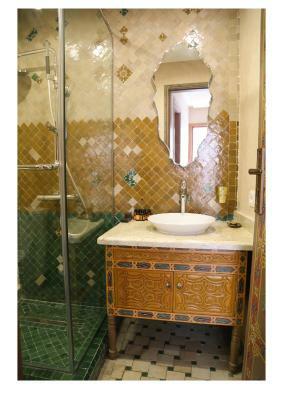 This suite features a tile/marble floor, bathrobe and seating area. 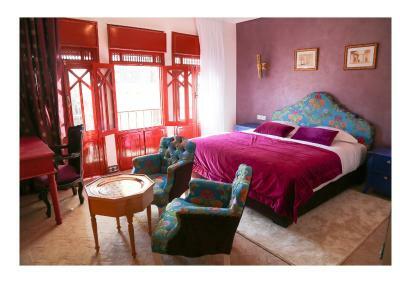 This double room has a balcony, dining area and satellite TV. 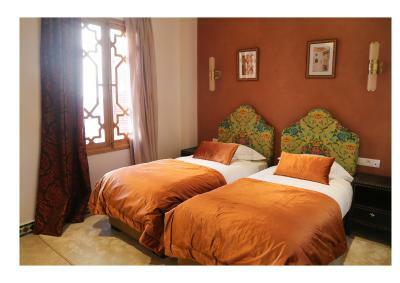 This double room features a dining area, bathrobe and air conditioning. 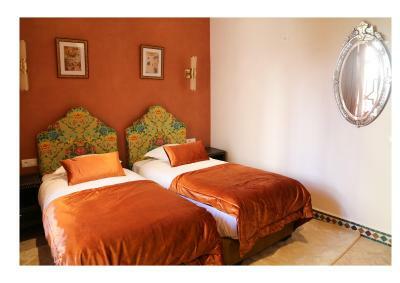 This double room has a tile/marble floor, seating area and patio. This family room features air conditioning, patio and satellite TV. 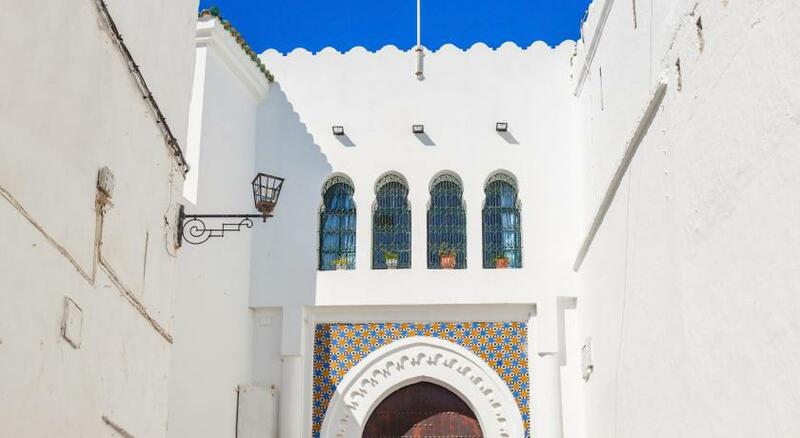 Property surroundings – This neighbourhood is a great choice for travellers interested in markets, Old Town exploring and culture – Check location Excellent location - show map Guests loved walking around the neighbourhood! House rules Palais Zahia takes special requests - add in the next step! 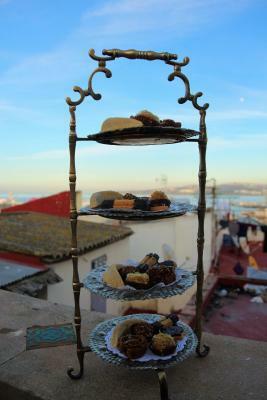 Palais Zahia accepts these cards and reserves the right to temporarily hold an amount prior to arrival. For all reservations of Deluxe Suites from 09/04/2019 to 09/05/2019 a guided city tour will be offered . Some shower boxes are extremely tight. Rooms overlooking roadway are noisy. We are 5 single persons and we had different rooms in terms in size, bathroom facilities and location within property. Generally we all had a good stay. All staff are pleasant and of excellent attitude. Surely we will come to same hotel again, and we would recommend it to friends. Mosque very close by is a great advantage for us. The hotel is near the central mosque, which woke us up early in the morning. 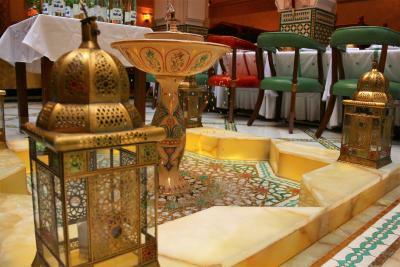 While the hotel is also very well located in the medina, it is too busy with the markets and tourists. The palais seem to always host really loud events in its restaurant which is right in the middle of the hotel and surrounded by all rooms. This really annoyed me, especially that i stayed four nights in the hotel and in all nights there was an event that would last till 11pm or 12am. Good location, between the marina and the old city. 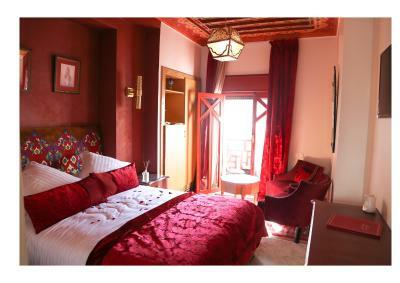 The photos of the Palais can be deceiving as it nor its rooms are not as spacious! 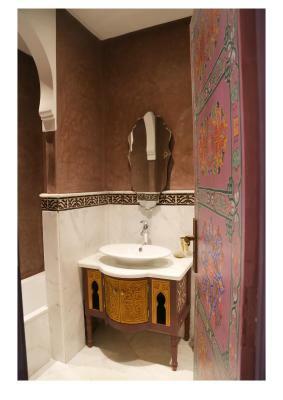 The only good experience in this palais is the Spa and Hammam. The masseur is a gentleman and an expert in sport massage. It would have been nice if our room had a courtyard facing window, but to be fair I only noticed so on the second day. The breakfast (included in our room rate) was a bit too simple for my liking. I was especially disappointed that there was no fresh bread. I a country with a French heritage I had expected that there would at least be baguette. Hard to explain exactly but the staff seemed a bit insincere. Very focused on selling hotel booked tours and making sure you gave them a good review on booking sites. The most annoying thing was a staff member that took advantage of my politeness by escorting me to a carpet shop that I had no interest in going to. Telling me it was a gallery. Also, we used the laundry service and were promised it would be returned the same day and it was not returned until the next morning. No one seemed to know where it was. The location is great. The finishing details are also very nice. There is a big rooftop terrace with fabulous views. Very clean. It is a beautiful little hotel. On a few of the nights we were there they had live music in the lobby until 10pm followed by the staff making a lot of noise. Since all the rooms face the internal courtyard, this makes it problematic for anyone who wants to sleep before 10pm. I'd prefer the music stop earlier and the staff keep quiet during the post-party cleanup. Room overall seemed stuffy since there's no window to open except the window facing the hallway (even with the A/C on). The breakfast was only so-so and the other meals were so over-priced that we ate all of our dinners elsewhere. Great location and nice overall atmosphere. 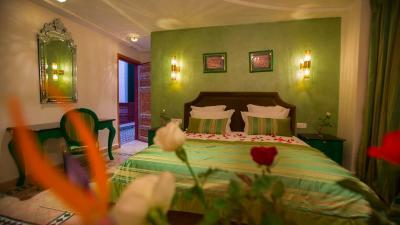 Rooms seemed recently renovated. Friendly staff. This is an amazing place and the staff are exceptional. Highly recommend. We will be coming back as soon as we can. I understand in Morocco almost everybody tries to scam you a little bit. What is quite another level is that hotel charge you for already paid stay. I usually make booking on my mobile phone on the very day for the convenience. This in general has been working well, especially when traveling off peak season. But they issue is then most of the time I won't read in detail the booking confirmation email on mobile phone, since booking.com app will tell you the booking is confirmed. Stayed at this hotel and paid 90 Euro upon checking out. The receptionist is very polite but tried to charge a bit more....so it's after I checked their printout of booking confirmation then we could settle the payment..Then later I found out that the booking is already paid by credit card, which is charged by booking.com at the time the booking is confirmed.. So now the hassle of calling booking.com...providing the receipt...etc. in order to get refund. The whole staff was wonderful. From the moment we arrived at the airport till we left. I can not comment enough about the staff. They were there to make sure our trip was most pleasant. I have arthritis and they all were concerned for my well being. The maid service was excellent. Also the 2 restaurants were wonderful. The front desk hired us a guide Margid ,which I am not spelling right, told us the history of Morocco and spoke excellent English. Took us to all the sight we wanted to see. Having a guide made the experience most pleasant. I would recommend this hotel very highly. The staff very helpful. The hotel had good food. We had a great guide a 6 hour tour. We would recommend this hotel. Price a little high but worth it . Due to beauty and services.